MyPilotPro Bundle is perfect for pilots who want to capture multiple angles on their action cameras! The MyPilotPro Bundle comes with the MyPilotPro Mount, MyPilotPro Swivel, and the MyPilotPro Wrench. Having both mounts ensures you will get the footage and angles you desire the most! The Bundle is a great value at 20% off the separate retail pricing of the products! Why settle for just one angle when you can get multiple! As always, each mount is made one at a time which ensures quality craftsmanship and all our products come with a 1 year money back guarantee. 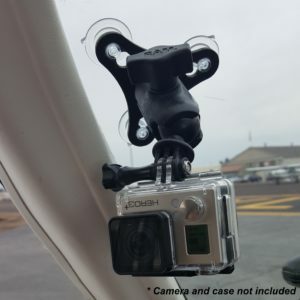 Both mounts are compatible with all GoPro and Virb action cameras. They are universal to all General Aviation and LSA aircraft. As long as you have a tie down, these mounts will attach! These mounts are small, lightweight, and fit in the palm of your hand. 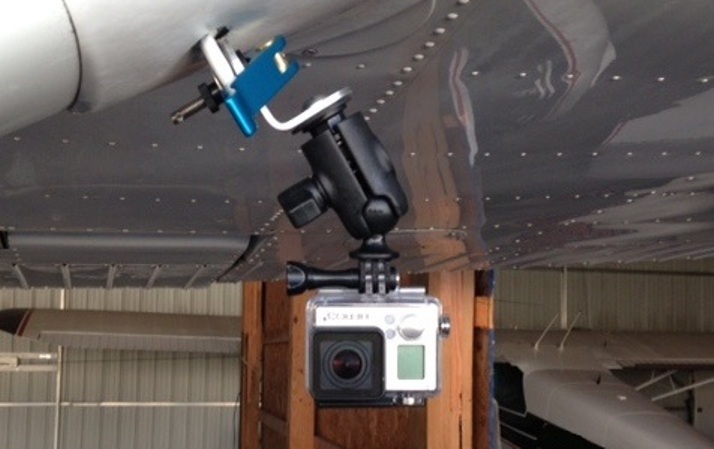 Attaching either MyPilotPro mount to your tie down ring could not be simpler. The cam lever eliminates the need for any tools and securely attaches the mount your tie down rings by simply closing it. There is a stainless steel cotter pin in the end of the stainless steel rod which ensures the mount can not come off the tie down ring even if loosens up during flight. Taking the mount off your tie down ring is equally easy and just requires opening up the cam lever and unscrewing the knurled nut. The process of attaching and detaching the mount only takes 30 – 45 seconds! After launching my own YouTube just under 12 months ago finding this attachment with a new GoPro is going to massively increase the production values! Best of all it can be attached and removed in 30 seconds! Why didn’t I think of it first – simple quick installation – wouldn’t hurt to have a larger nut for those of us with dexterity problems. 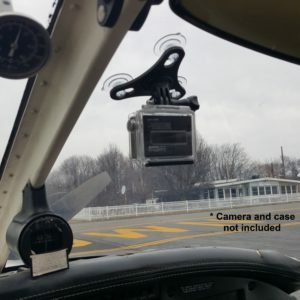 I used this mount on a Beech V35 Bonanza at 165knot cruise with not problems. They work as advertised. I safety wired my gopro to the mount being a little nervous about the camera connection. So far so good I would buy them again. 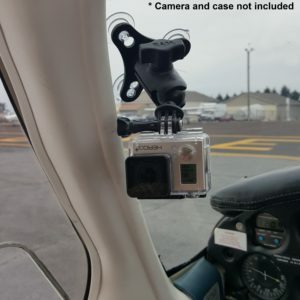 I ordered the aviation mount bundle as it seemed to offer exactly the solution I was looking for, namely a way to securely mount my GoPro Hero3+ externally on my RV-9A using the tie-down rings under the tail and the wings. The order was shipped and arrived very quickly and was well packaged. The first thing which was apparent on opening the box was that the mounts are extremely well made from very good quality materials (I was delighted to note that the swivel mount is a genuine RAM mount). I love the cam lever to clamp it really tightly so the camera is in no danger of moving at all whilst in the air, and the “R” safety clip which goes through the end of the threaded bolt is a brilliant idea. Even if, by extremely bad luck, the tightening thumbscrew were to vibrate completely loose, the clip will prevent the mount (and your expensive camera!) from detaching from the aircraft and getting you in lots of trouble with the FAA or CAA! I used the standard mount on the tie-down ring under the tail and the swivel mount on the ring under the wing (and the additional 3-way arm which is also in the kit gives even more flexibility). Both were easy to fit and both gave excellent results. I was a bit worried that my videos might show some vibration (the dreaded “jello effect” which is apparent in many GoPro aviation videos and which I often get when mounting the camera inside the canopy with a suction mount) but I am delighted to say that on my first two videos (I only tried it out for the first time last weekend) there is no evidence at all of the jello effect. I’d purchased another type of mount that came with incorrect screw sizes to mount directly under the wing. It was a waste of my time. I came across MyPilotPro. Their service was prompt. The products are very well thought out and made. It took me a couple of minutes to unbox them and mount one to each tie-down ring. Solid as a rock. The video I have gotten from this on just my first flight with it has been great. I can not wait to see what other great footage this gets me. I am in the process of ordering my second set as a gift to a fellow Pilot because of the quality and service. Thank You Marshall for all your help and look out for some great videos!! Defiantly Worth it!!! !